NEW YORK—If the city gets hit by another hurricane, a mile of concrete walls, strengthened power lines, and other systems will help prevent the massive and long-term blackouts seen during Hurricane Sandy. 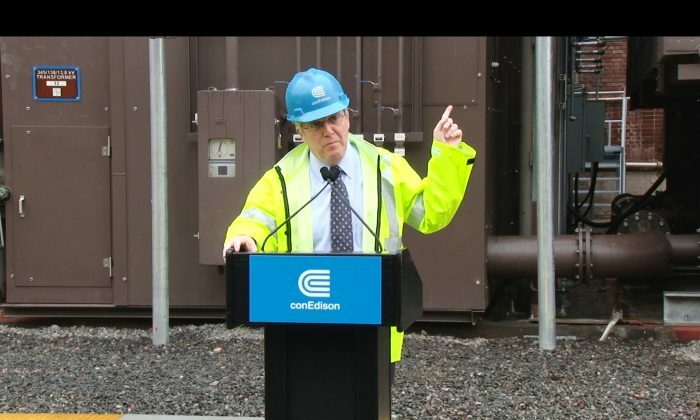 Consolidated Edison Inc. CEO Kevin Burke gave reporters a tour on May 28 of a newly hardened power station to demonstrate the upgrades. The station at East 13th Street in Manhattan had been flooded by waters brought by Sandy. During the hurricane, an estimated 925,000 Con Edison customers lost power, according to a press release. Similar walls were built 10 locations, he said. During the hurricane, Con Edison had to shut down two underground networks in downtown Manhattan. Burke said they had to do this because they knew the water would get into the streets and into their equipment. “And we knew that water was going to get into the customers’ equipment and damage both the customers’ equipment and our equipment,” he said. To prevent a similar scenario from happening, Con Ed installed switches, and divided the networks into two parts—which will allow them to turn off power by sections—instead of shutting off the whole network. Similar switches were installed in others parts of the city. Burke said the switches will let them keep more customers in service, and if an area does lose power, Con Edison can get it back online sooner. Work has also been done overhead. Con Edison installed stronger poles, stronger cables, and smart switches. “If we have an area and a tree falls on the wires, instead of a larger area getting taken out of service, it’s just the area between the switches that will get taken out of service,” Burke said. “That’s just what we’ve started to do,” he added. Burke said that Con Edison made a commitment to Mayor Michael Bloomberg to invest a quarter billion dollars to protect against flooding. They also sent a proposal to the Public Service Commission for a billion dollar investment over the next four years. “We think that with [the additional investment] we’ll be in much better shape—we’ll be in much better condition to continue service to our customers,” he said. He added, however, that at this point it’s not looking like Con Edison will get any reimbursement from the federal government. Additional reporting by NTD Television.